I've learned to put the past behind me and never look back. I'm not one to "take it back to the old school"; you'll never catch me longing for the 80s; or catch up with an old friend to discuss an event that occurred 20 years ago; or reminisce about the "good ol' days." I love living in the Present. A few days ago I accessed my old Shutterfly account and found this picture of me from November, 2006. 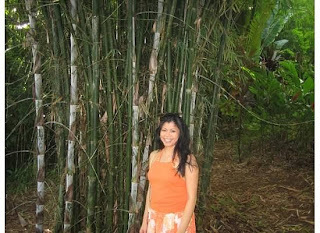 I was shocked not only at my heavier self but at the realization of how far I've come from that woman standing in front of those bamboo trees. These are those rare moments when looking back is a good thing because it knocked me off my woe-is-me-I'm-a-loser-I-haven't-done-crap-with-my-life soapbox. It's so easy to focus on what hasn't happened in my life, what I have yet to accomplish, and what dreams haven't been fulfilled. Finding this picture sucker punched me out of my doldrums. Seven years ago I was 15 pounds heavier and I can't tell you why except that I was secretly depressed with the facade that was my life. I stopped running and exercising, hiding behind my smile-now-cry-later mask. Seven years ago I wasn't fulfilling a higher-calling like the one I am now in the fight against human trafficking. My heart didn't burn as an abolitionist and I was devoid of passion for anything bigger than myself. Seven years ago the thought of being a grandma brought horror to my heart. Since then my life has been blessed with an indomitable spirit in the form of Rylee Sage. I was ignorant of the monotonous life I lived then. Seven years ago my oldest daughter took off for college to be a nurse and an inexplicable depression set in for 2 weeks. Today she's a R.N. at the VA Hospital in La Jolla and continues to amaze me every day. Seven years ago I almost gave up in the restoration, reconciliation, and redemption in my relationship with my kids. Today I can say with gratitude that my three kids and I have a beautiful bond of love and respect. Seven years ago the dream of becoming a professional photographer was still sitting on the back shelf of my mind---forlorn, dusty, and encased in cobwebs. Click here to see that dream fulfilled. Seven years ago I was a ticking time bomb with health issues: fibroid tumors, high cholesterol, hypertension, anxiety, and depression. Back then "eating clean" meant washing my hands before a meal. Duh! Seven years ago my intimacy with Jesus was lacking and almost superficial. Since then I've learned that a deeper intimacy with him brings peace amidst the chaos and confusion. Seven years ago running a half-marathon was a Herculean task that was unattainable. Today an armada of race medals are blatantly displayed as a daily reminder that the impossible is achievable. Seven years ago the dream of becoming a writer and publishing my work was a bad joke. The only outlets I had for my writing were my journals and old blog. I had no inkling that the writing course I enrolled in teaching me to submit articles for magazines was going to pay off. Thanks to my editor, Cameron Conaway, I'm now a social justice writer for an online magazine, The Good Men Project. Seven years ago I toyed with the idea of traveling on mission trips but fear manifested excuses. After traveling to the Philippines for My Refuge House in 2009 and Tecate, Mexico in 2012 I kicked myself for being a wuss and waiting so long! Seven years ago I didn't know I was going to reconnect with the boy who hijacked my heart when we were 15-years-old. Like the Allspark shard it remained in his possession for 25 years until our reconnection revived me in 2008. Life has been equal parts comedy and adventure since! Today I encourage all of you to stop making excuses and take a leap of faith in whatever you're dreaming about, praying for, and planning on. Disappointments, failures, and disillusionment are stepping stones to your success. Do it now! You only have the Present. There are aspects in my life that haven't met my expectations but I won't waste valuable time focusing on them. I prefer spending my time consumed with thankfulness for the growth, miracles, wisdom, and surprises the past seven years have brought.